It rained steadily for most of Saturday, soaking autumn’s fallen leaves into a coarse wet mat that covered soft and muddy ground. By Sunday most of the USGS gauges in the area had spiked and were on the way down to seasonal levels. The sun had returned, yet it was looking like an afternoon trip to a big river would be a marginal call at best. 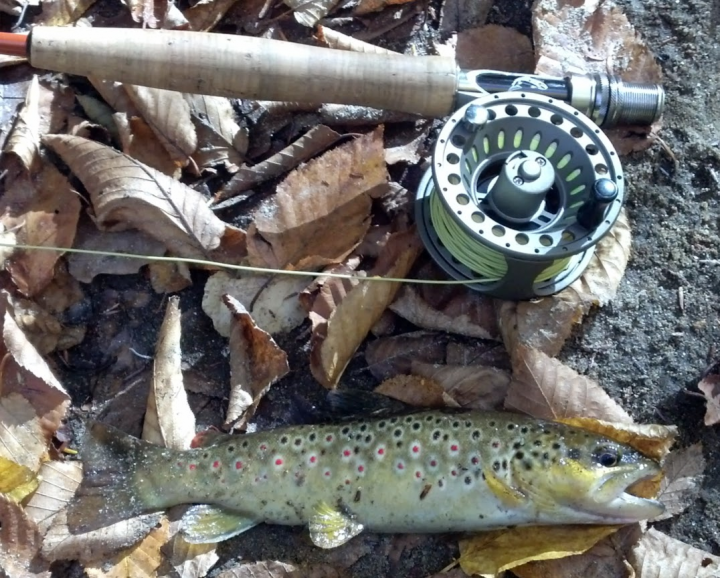 Then I decided to visit a small wild trout stream near my home. Unlike others in the area, it flows intermittently at best. 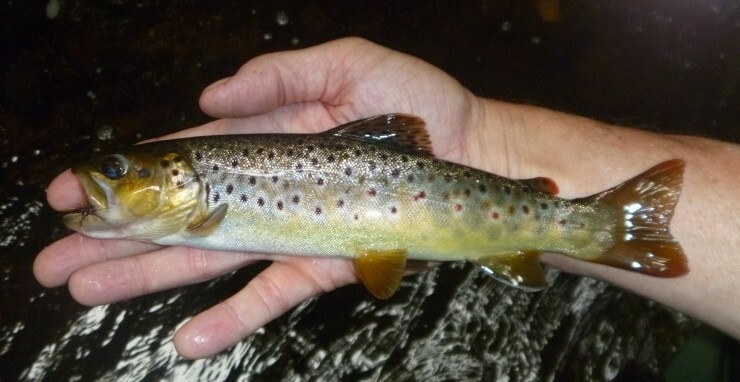 The melting snow of spring provides the infusion necessary for it to be a nursery for wild trout. But by summer it’s reduced to a shallow series of pools connected only by the meager life support of trickling flows. 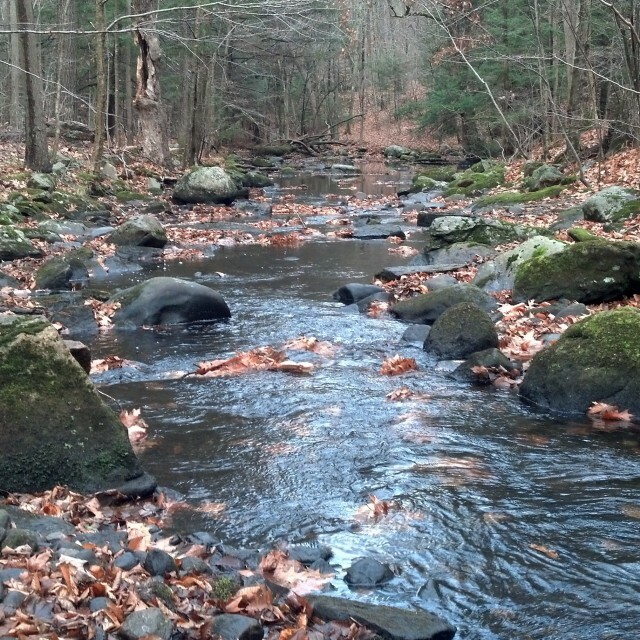 When I arrived the stream’s surface was littered with leaves, all floating leisurely in a mild current. The rain had overfilled the pools, creating true riffles and runs. 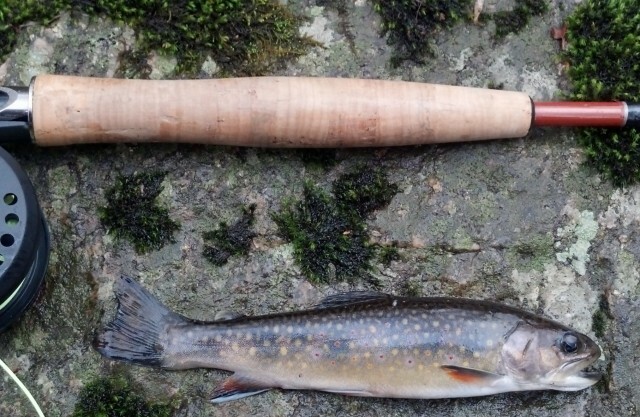 I stood on the shaded bank and tied a small caddis dry to the leader of my 7′ 4wt fiberglass rod. My approach to fall fishing is more cautious. I move slowly among the trees and rocks in an effort not to spook the fish. 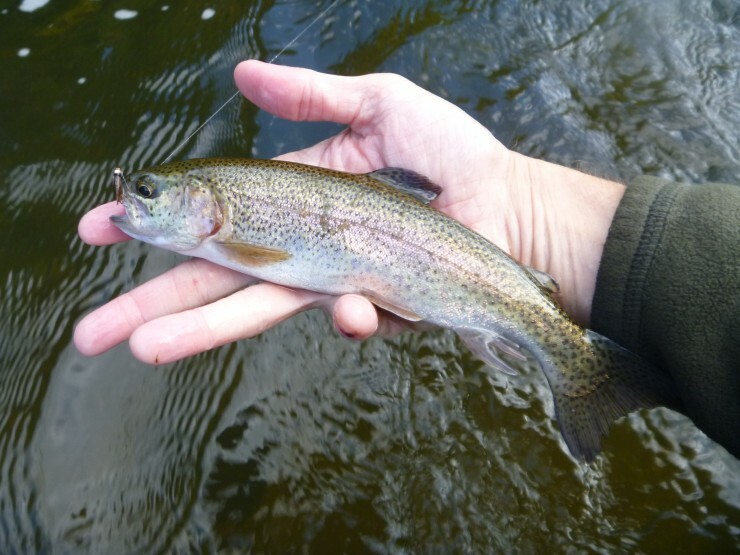 More time is spent studying water before casting or wading in. Today was no exception. 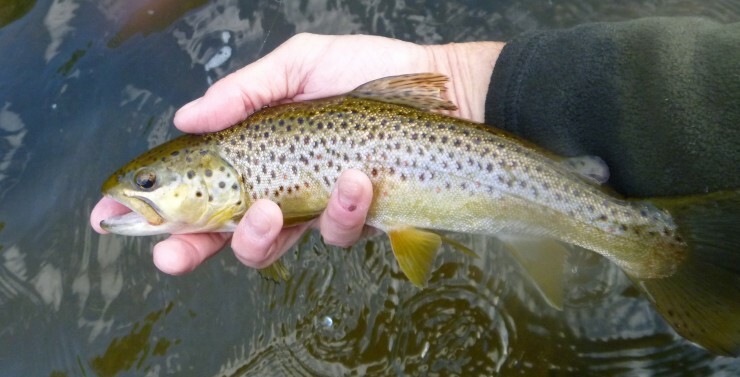 Standing on the rocks at the head of a narrow run, I watched for signs of active trout. For several minutes I focused on an area just to the left of a partially submerged boulder, 2o feet downstream in ankle-deep water. There had been some movement when I first arrived, but falling leaves often imitate riseforms. I wanted to be sure that it was a feeding fish. 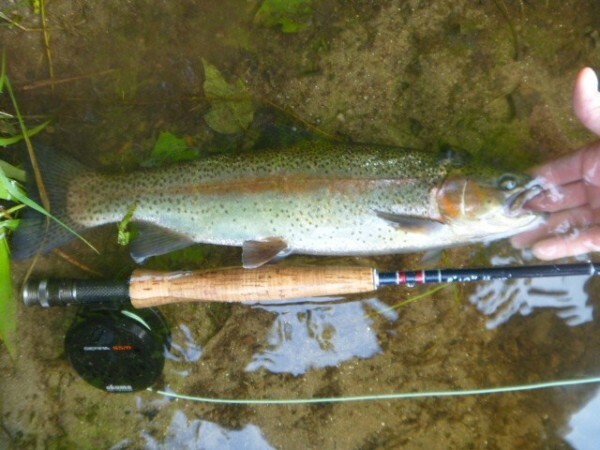 In a pool of this size, second casts are rarely well received. Another set of rings appeared. I cast just short of them and waited. 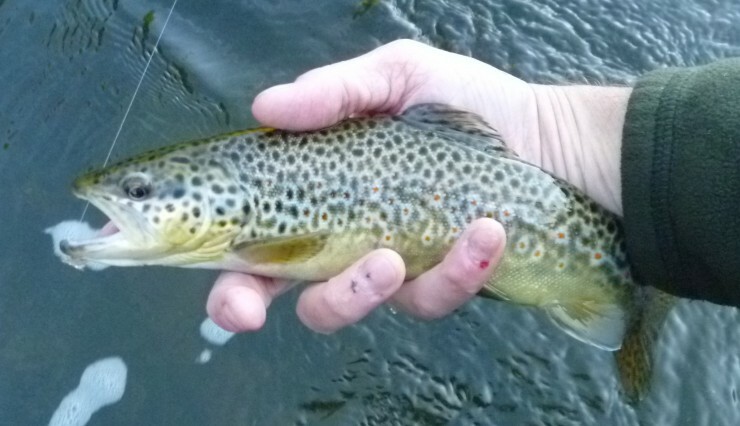 Within a split second a feisty wild brown took the caddis and tore off. He shook his head, then jumped when the line went tight. True to form, he protested all the way to the net. A quick picture and he was back on his way. 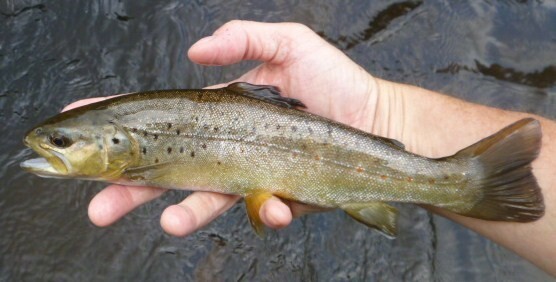 This is the first wild brown that I’ve caught in this stream of native brookies. It is also the largest, coming in at a whopping ten inches. 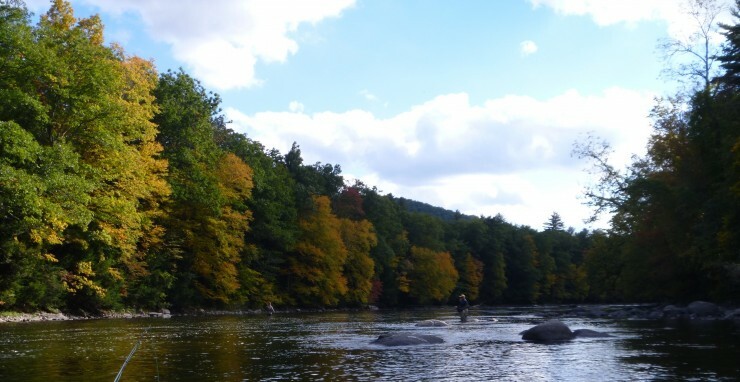 These next few weeks will be some of the best trout fishing in the northeast. Hope you’re giving some consideration to streams that are often overlooked.